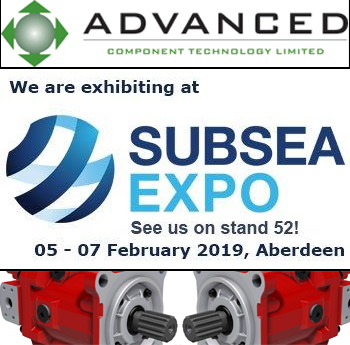 Adrian Cottam – ACT Sales Director reports that the ACT engineering team are eagerly anticipating the start of SubSea Expo next week at Aberdeen. We will be presenting the full range of Kawasaki Pumps and Motors, including the K3VL, K3VLS, K7VG, K8V & K7V, and Staffa HMB, HMC, & HMF radial piston motors. The product range are supported by ACT’s large stocks, offering ex stock despatch, together with our technical and application support.